The East End and the internet are up in arms about Cable Street's forthcoming Jack the Ripper Museum. We speak to the museum’s owner, and some of those who have protested against his enterprise. Someone is pleased to see Mark Palmer-Edgecumbe, the man behind Cable Street’s forthcoming Jack the Ripper Museum. We get a cup of tea at the café next door and the woman serving us takes a lot of care ushering us to a table and checking that Mark will be in later for lunch. Mark suggests that the museum will bring jobs and work to the area and the café is keen to have him in there. The man behind the museum comes across as rattled, yet somehow detached, from the furore over his endeavour. In July 2014 architects submitted a change of use application for 12 Cable Street to Tower Hamlets Development & Renewal, with plans for a ‘Museum of Women’s History'. The supporting statement is full of images of women protesters — from Suffragettes to recent anti-racist protesters — as well as references to the matchgirl strikes and the “East End as a centre for international politics (Lenin, Trotsky, Gorky, Rosa Luxembourg)”. "Well Jack the Ripper is the most influential person of the East End," says Mark between sips of tea. He quotes George Bernard Shaw in saying that the Ripper murders did more for social reform than any well-meaning efforts, shining a light on the impoverished lives of women in the Victorian East End. There is a ******* new Jack the Ripper Museum opening in Cable St tomorrow, next to Wilton’s Music Hall. A ******* museum dedicated to violence against working class women, in ******* historic Cable St. The street itself is no stranger to protest; the Battle of Cable Street saw the local Jewish community and communist protesters preventing the British Union of Fascists marching down the thoroughfare. Cable Street has "a glorious history about resisting Mosley’s fascists in 1936," Jemima Broadbridge told the East London Advertiser the same day. Jemima first heard of the museum when Julian Cole and Cable Street resident Daniel Lucas saw the revealed frontage last weekend. They contacted her because of her experience in local protest — she was the spokesperson for the Spitalfields Market Under Threat campaign from 1999-2003. The story went from the East London Advertiser to the Evening Standard, across their office to The Independent and then all over the national press. It has now moved on to radio and television. Unsurprisingly social media churned with anger over the nature of the museum and the perceived trickery of the planning application. Website Bustle attempted to capture the Twitter storm with the post 9 Scathing Tweets About The Jack The Ripper Museum Saying It's Not OK To Glorify Gender Violence, while local author Alan Gilby wrote that Mark Palmer-Edgecumbe "claims a celebration of female social history was his original intention, but the story of the Ripper's victims became more compelling. That's why they're so prominently represented on the logo of the museum. They're the smear of blood on the floor". This is really sordid and against women of the past and completely unacceptable. Mark would disagree with the sentiment. He points out that he has worked for 20 years in diversity and is passionate about the rights of women. He insists that the museum will not be the London Dungeon or a 'gorefest'. It is there, he says, to educate people on the misery of women on that era and what choices they made. Mark is the former head of diversity and inclusion at Google for the UK, the Middle East and Africa. He was a governor of the Museum of London from 2005 to 2013 and was the chairman of the Museum in Docklands from 2006 to 2009. It was Museum of London Docklands' Jack the Ripper exhibition of 2008 that — he says on the Ripper museum's website — inspired him to open "a serious examination of the story of Jack the Ripper, telling the story from the perspective of the women who were his victims for the first time". This statement may be contrasted against the 2014 application for a museum of East End women. Cathy Ross, author and Honorary Research Fellow at Museum of London was brought in to write the guidebook and as a consultant to professionally curate the museum and to bring a similar sense that the Museum of London Docklands' exhibition carried. At the time Londonist described the Docklands Ripper as an “impressively serious exhibition”, so perhaps there is hope for Cable Street's museum. So what can we expect from the experience? Women’s dresses and bonnets of that period will be displayed at the museum along with newspaper clippings from the time and the whistle, truncheon, hand-cuffs and notebook of PC Edward Watkins who discovered the body of Catherine Eddowes on Mitre Square. There is a recreation of the Mitre Square murder scene, which features a mannequin, but "no blood". We also ask Mark about the museum's logo, which has been roundly criticised. It is a stereotypical ‘Victorian gent’ silhouette of Jack the Ripper with blood spattered a long way behind him. It is available on t-shirts and mugs. Mark says the logo does not represent the women but Jack the Ripper himself. We've got a problem with that claim. "But the blood is not Jack the Ripper's," we say, "it belongs to the women." This is one of two times Mark, who has that confident distance of someone who has succeeded in life, is not able to answer. "Seriously," we ask, "what was he thinking with the façade?” The black frontage with red type, inviting people to visit "the morgue and see the autopsy photos and reports of the murdered women"? Apparently, the plan was always to recreate a Victorian shop front, but the frontage changed as the museum developed from a women’s museum to a 'victims of Jack the Ripper' museum. 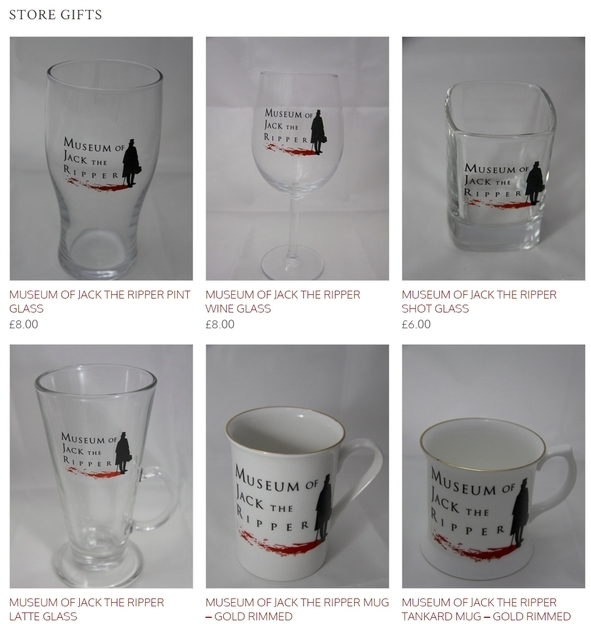 The full name of the museum is 'The Jack the Ripper and the History of Women in East London'. The frontage is not finished and still in the planning stage. The website has a different tone: "On the table, you will find medical instruments, poison, drug bottles and a skull belonging to the killer," says one description of the exhibits. "One of the morgues used to store Jack the Ripper’s victims was only a few streets away from where you stand now." "The full name of the museum is," Mark says, "The Jack the Ripper and the History of Women in East London." The frontage, he claims, is not finished and is still in "the planning stage”. It is "half done" and in hindsight he would not have revealed it this early. Right. So when will the façade change then? Mark doesn’t know; it’s in "planning". The skull and cross-bones on the front of the museum has already been removed. It is due to open next week (4 August) and work is continuing. Meanwhile, far-left action group Class War has a protest planned for 5 August and there are rumours of another protest on the day before opening. 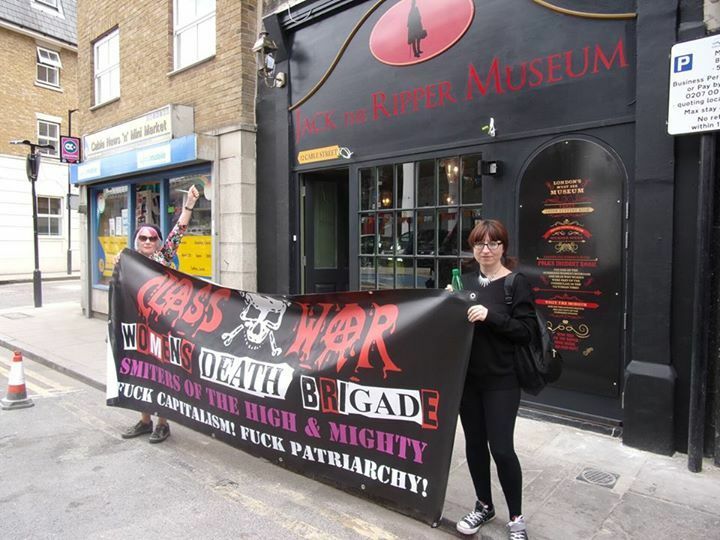 The Class War Women’s Death Brigade has already protested once outside the museum. There may be more protests coming, and the Eaves Charity, which fights violence against women, is denying a claim it is to receive donations from the museum's takings. The charity says it has asked to be removed from the museum's website. And the place hasn't even opened yet. But Mark suggests that just as horrors of Jack the Ripper aided the broader reform for the people of the East End, so the anger generated by the Ripper Museum has helped galvanise local historians and activists. Cheated out of a women’s history museum Sarah Jackson and Sara Huws are crowd-sourcing an East End Women’s Museum with an enthusiastic response so far. While Jemima Broadbridge tells us that ideally she would like the museum "to include some actual historical content about the women who became victims of Jack the Ripper — about their lives, where they lived and who they were," Mark would argue that that is what he is doing. The rage so far has been at the bloodied branding, gothic façade and how the website is worded. This is, essentially, a history of murdered, vulnerable women. He does not wish to cause distress or offence to anyone he says, he has been at pains to tell people this is a museum of women’s social history perceived through the frame of Jack the Ripper. Whether Mark is sincere or not, you'll have to decide for yourself. Certainly, he's not in for an easy ride over the next few months. After a planning application that promised a women’s museum became the Jack the Ripper Museum in its logo, merchandise and signage, Mark now needs to deliver a credible experience. He is focussed on the museum's success but, perhaps, he has found himself seduced into the Jack the Ripper mythos too far and presented a horrific piece of London history as a mere dark peep show. Mark must deliver something that matches his words, which so far, the Jack the Ripper Museum has apparently failed to do. At present, he seems to be the only one learning anything of value from his venture.